And as we’ve waited to see this film, another question has been lurking in the darkness that needs an answer: to 3D or not to 3D? If you’re looking for a review of the film proper, you’ll want to hear over to our official critique. Otherwise, it’s wands up as we take a look at the 3D magic that has graced Fantastic Beasts: The Crimes of Grindelwald! Presenting Fantastic Beasts: The Crimes of Grindelwald in 3D is as easy a decision as one could make. With wands constantly drawn, spells and creatures flying hither and thither, and big ticket action being staples of J.K. Rowling’s universe of wonder, it’s a no-brainer. Considering every Wizarding World since Harry Potter and the Order of the Phoenix has had a 3D option to its release, this is basically a component that’s been built into the franchise. For a franchise that’s been working wonders in the third dimension for as long as it has, the Wizarding World has had a lot of experience with 3D conversions. What’s more interesting is the fact that Fantastic Beasts: The Crimes of Grindelwald seems to have done a better job than its predecessors. With only one minor — but outstanding — flaw, this conversion is a pretty fantastic product. Most 3D films don’t regularly use the effect of throwing or projecting objects out of the screen to the best result. So it’s quite surprising that Fantastic Beasts: The Crimes of Grindelwald actually uses this portion of the 3D universe to a dazzling degree. Wands are pointed out into the audience, Thestrals fly through the sky and out of the screen, and there’s even a couple of jump-scares that manage to make the audience flinch. If you’re impressed by what’s thrown out of the screen in Fantastic Beasts: The Crimes of Grindelwald, you’re definitely going to be impressed with the depth of picture on display as well. Characters and their environments are clearly separated by fields of spatial reasoning, with the minimal depth being drawn to help them stand out. But what’s particularly interesting is the near infinite depth in the background of the image, with some aspects in the background even remaining active, rather than static. 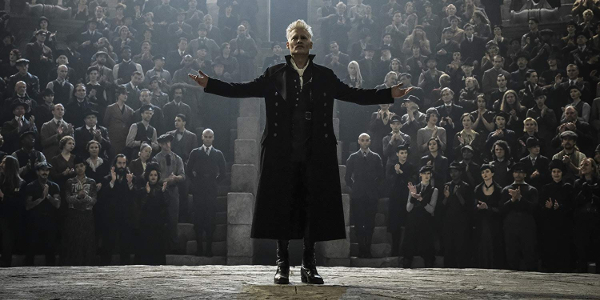 Alas, there is one big flaw when it comes to Fantastic Beasts: The Crimes of Grindelwald, and it’s a familiar adversary at that. Your mileage may indeed vary when it comes to the brightness of a 3D film’s picture, due to the degree of care your local theater might put into maintaining their projector and theater. However, the Fantastic Beasts world has always had a subdued, slightly washed out color pallette in its natural form, and the grey glasses automatically add onto that effect. So if your presentation isn’t bright enough, it’s a bit hard to watch. When and if you need to take your glasses off during a 3D presentation, you’ll notice that the picture looks a bit blurry. This blur is usually a good indication of how the image has been manipulated to generate the 3D effect desired for the audience. With Fantastic Beasts: The Crimes of Grindelwald, the blur effect is pretty rich in both the background and foreground aspects of the image. There’s only minimal moments of 2D picture present, so as to anchor the rest of the picture in 3D contrast. While you’re not going to get sick while watching Fantastic Beasts: The Crimes of Grindelwald, there are still some sequences that might play havoc on your eyes for the moment. In particular, there are some scenes where a combination of camera work and fast motion of objects will leave one’s eyes a bit confused. It’s not a particularly huge drawback, and it’s limited to certain outlying moments, but it’s still notable. Fantastic Beasts: The Crimes of Grindelwald is a pretty spectacular 3D conversion that hits at the right moment. A good 3D film has been needed for some time, and between this and Dr. Seuss’s The Grinch, it’s the perfect time to go out and catch some third-dimension spectacle. How Will You See Fantastic Beasts: The Crimes of Grindelwald?